So an odd/fun/random/spur-of-the-moment thing happened. It started with my NaNoWriMo project. The love interest is a trainhopping, attachment-free, badass. So, I decided he needs a hobby—something completely unexpected for that persona. And it needs to be something he can do to pass the time while catching out [i.e. riding the rails; hopping trains.] Something “soft”, traditionally “non-masculine”. I rolled through a few possibilities before settling on knitting. In the process, I discovered Arm Knitting. That’s a thing??? Yes. A cool thing. Knitting using your arms instead of needles. And, using heavyweight yarn, the process goes quickly. Aha! A quick, no-tools-needed way for Athan to pass the time trapped in a rattling freight car. And since the world has an ingrained magic system where the purpose of an object [and thus it’s color, texture, density] can be warped, Athan has access to a limitless supply of “yarn”. He simply needs to transform tiny sections of the metal forming the train car. As icing on the cake, this idea of weaving two separate skeins together is a perfect symbol of the central conflict my MC is facing. It’s also gloriously symbolic of the romance subplot. Perfection, I say. Athan is highly gifted at warping & knitting. During long train rides, there is the obvious opportunity for him to teach that skill to my MC, Doff. Oh.the.moments. The symbolism. 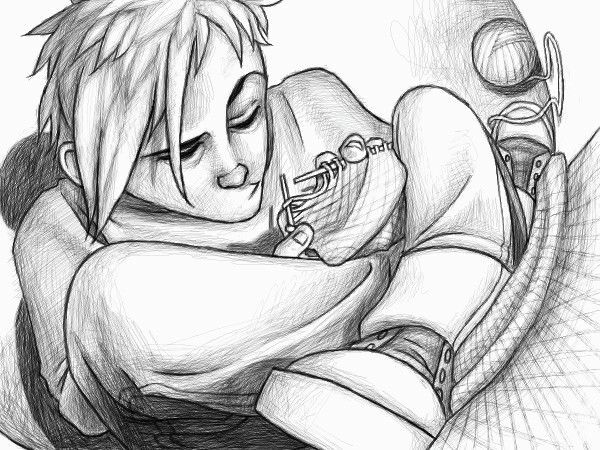 The ways Athan can playfully take advantage of Doff while his hands are bound in yarn cuffs. But before I can write that into their story, I need to know how to Arm Knit, what it feels like. So, with the help of a YouTube vid: http://www.youtube.com/watch?v=sqvC1xlm86U&feature=youtu.be, I learned. Today. For the hell of it, kinda accidentally, I ended up live-Tweeting my learning process & the emotions that went along with it. If you’re so inclined to check it out, I used the hashtag #LucasArmKnitExperience. Quickly, folks tapped into my virgin arm knitting experience & turned it into a beautiful, fun conversation. After the highs & lows, the successes & failures, photos became a necessity. So, obviously, an impromptu photo shoot showing the end results of my first arm knitting attempt was required. The whole live-action-learn-a-new-thing experiment was fun. Not only did I learn a new skill I can teach my characters, I also experienced the feeling arc of curiosity/frustration/peacefulness/accomplishment/celebration. Doff will feel that same progression. On top of all that, other folks decided to catch out with me. And, perhaps, I can recreate that excitement & willingness with Doff & Athan’s story. I just need to write it first. NaNo, here I come. This entry was posted in Artwork, EpistleOfDoff, NaNoWriMo, Novel, Writing and tagged Arm Knitting, Athan, Doff, Real Men Knit, Research, Twitter. Bookmark the permalink. First attempt! There’ll be more. Looks like you did pretty damn good to me! I can’t knit to save my life. If you need another writing buddy, I’m trying NaNoWriMo for the first time. I’m KickboxingWriter. It was an educational blast. I’m GypsyLuc on the NaNo site. That sounds significantly more dangerous than arm knitting. I don’t think you will be taking quick dinner breaks for meatloaf for that research. Nope. Probably beef jerky or feral cat. For your first arm knitting experience, the final product looks great! And you’re a hilarious, entertaining pro at live tweeting. I do like me some hot, live-tweeting action.